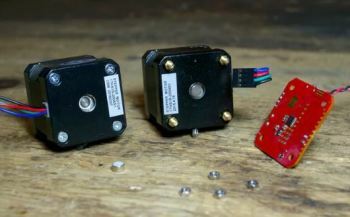 The team hopes that these motors can be used for developing custom servo applications in the fields of electronics, robotics, or automation. The motor can also be used in existing 3D printing or CNC applications. Position, velocity, and torque can all be monitored and controlled through the system, along with the possibility of custom control applications. The motor itself is a Nema 17 stepper motor 17HS16-2004S, running at two Amperes and 45 Newton-centimeters of torque. The motor’s precision is 200 steps per revolution, and are already by makers in several 3D printing applications. The processor is an Atmel ATSAMD21G18, and Tropical Labs says that it’s compatible with Arduino Zero. The motor driver is an Allegro A4954 and the unit also includes an AMS AS5047D 14-bit magnetic encoder. GitHub hosts a wealth of information about the project and more information and documentation is available through YouTube and the Tropical Labs website. The website especially lays out a long term wishlist of goals, benefits over currently available product, and possible applications. 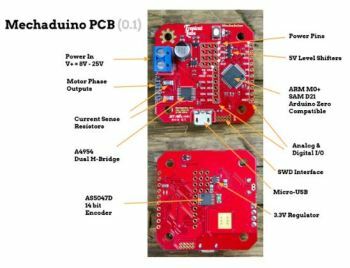 Mechaduino is a great example of the maker spirit in action combined with a strong commitment to open source methodology. The project has blown by its initial goal of $7,5000 and will be funded on July 20, 2016. Units are expected to ship in September, 2016.